Emerging from a frenzied weekend of knitting (it was great!) comes the completed body of the Aran - all ready to be sliced and diced. The 5-stitch stockinette panel you see running down the center of the soon-to-be-cardigan is where I'll be doing the cutting (The actual 'cut-line' is scored in the photo below with the dotted line of red wool). After that, I'll just need to add the button bands and the collar. Oh how I love the seamless. For now, though, it's time to start reinforcing for the cut! Scary moment... you're brave. Can't wait the triumphant outcome. this is so exciting! I can't wait to see!!! That is so gorgeous. I'm impressed with how beautiful it is and how fast you're knitting it up! Ooooh. I've yet to attempt the steek, but it does give me a thrill to see others do it! The cardi is absolutely stunning, can't wait to see the FO! that came out amazing! I can't wait to see it sliced! It's going to be awesome. And it will make a great jacket for the cool spring weather. WOW is that one magnificent sweater! Steeking - not for the faint of heart. I can't even begin to imagine. All those tiny little stitches screaming in agony. You are a brave man. I love those little spcks of color on the dark brown. Like the others said, you are very brave. I would need to "reinforce for the cut" with maybe a little tequila. looks WONDERFUL! Good luck with the steeking! Very impressive. 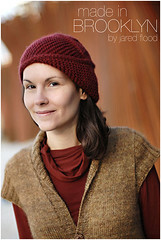 I'd love to know how you did the decreases on the yoke, the pattern fits perfectly there. Have fun with the steek! The cardigan is gorgeous but I hope you could spare a couple of minutes to explain the steek and the few rows beside it? Is the line next to the steek a purl line? Perhaps a fold line? And the next vertical row? Wow, the sweater is fantastic! 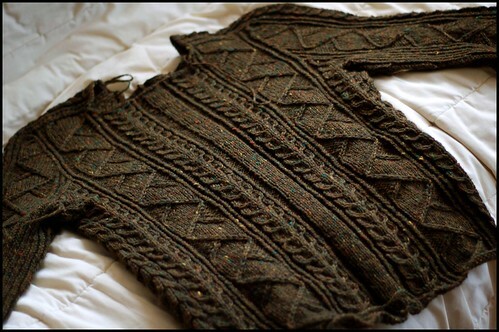 The cables and the yarn work perfectly together, and it looks so comfortable and interesting! And you're such a brave man, steeks terrify me! Seamless is the way to go. Beautiful cardigan. 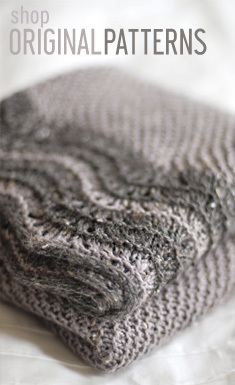 I LOVE the combination of the cable pattern with the tweed yarn! I think you have yet another masterpiece in your hands. How do you work up the courage to steek? I am going to try it on a sweater for a teddy bear first and then we shall see....... That is one handsome sweater! Oooo, gorgeous!! That is a thing of beauty! Ooooh Aaaaah! I aim to be as good at Aran as you one day :) Well done! That is one gorgeous work of art! Love the design, stitches and colors. doom doom doooommmmm!!! I can't wait to see it, it looks wonderful. Man I wish my knitting weekend could produce that. BTW, since you are a tweed master. Which do you like better, tahki donegal tweed or classic elite skye tweed. I am thinking about ordering some from WEBS but haven't had a chance to touch and feel either. It's fabulous! I can't wait to see how the cutting goes. :) You are a brave, brave man. Knit perfectly, like always. Lovely yarn and color. Is this for yourself? Wow. That's beautiful, each piece you knit continues to impress me more. Truly beautiful - I'm jealous. But not of the cutting part - that just scares me. Good luck - can't wait to see the final product! oooh, that is so beautiful! Unbelievably gorgeous! 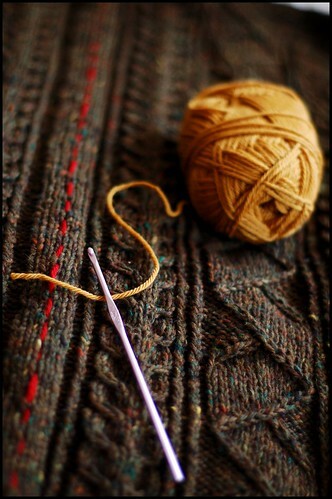 Looking at your fine work, steeking seems to be the most logical way to create your cardigan. Every stitch and design match perfectly. oh! This is SO beautiful!! When I see your photos -of any project- I want to make it too! I LOVE it! I can't add much more than what everyone else has said, but you are BRAVE! I can't wait to see the finished product. Great job! That looks absolutely fabulous. Good luck with the "surgery!" Ok. You are the Man. Question: Do you cable without a cable needle? Just curious. Fabulous colors and I love the pattern. I cant believe you people steek your knits, I would be petrified to do that to mine. I cant wait to see the end result though. Do you think you could be talked into photo-documenting your steeking process? I'd love to see you do it. The sweater is absolutely breathtaking! Beautiful work! Looks great! I was actually very attracted to that strong stockinette stripe down the front, so I'm a little sad that it's the steek. Oh My!! I'm sooooo impressed I'm about to cry! Its absolutely gorgeous!! You're going to do what to that beautiful garment? Take pictures every step of the way....I wanna see this!! I hope you have a drink prepared for the steeking. Or a friend to do it for you! I'm terrified of steeks or anything that involves any measure of sewing. Wow! It's gorgeous and I can't wait to see it post-op! Oh my goodness! What a beautiful sweater. I love the way the cable(?) looks like a ribbon folding. I can't wait to see it finished. Awesome sweater! I hope to have some photos of my red light special to share shortly... The pattern is very well thought out and really fun to knit! Oh wow, that is beautiful. Like many others, I can't wait to see it completed. I have yet to get up the guts to steek anything, but that will soon change- I try to challenge myself with one thing per big project, and steeking is next on the list. wow. didn't you just start that yesterday? seems like it. I'm so impressed. I'll be watching. I'm going to be steeking too in a while!! that's a stunning piece of work! what a beauty. i want to do one as well. and i hope you will make a tutorial on a couple of things. you must be very satisfied with yourself these days. Oh, I remember how your Skye Tweed sweater and mine were to be siblings. I guess that makes mine the runt, as "he" only has a back. That's a gorgeous piece of work! I want one. It is so beautiful. Looking really good so far, I love that it is seamless. Huh, keeping my fingers crossed for the cutting to work out well. Wow, that is going to be one gorgeous sweater. I love the tweedy-ness of the yarn, with all those pretty colors. Once again, your prowess and exceeding good taste have humbled me. Knit long and prosper, Sensei. you are braver than i! never having steeked, i am scared for you, but i am sure it will go swimmingly. Absolutely STUNNING! I love, love the yarn, the pattern, everything! And, as always, love your photography! I have never steeked so I know nothing first-hand, but I don't recall ever seeing a sweater with steeks that wasn't knit on needles size 3 or smaller. You are a brave man! Good Job- DO you think the Urban Cardigan could be steaked? Did you Steek that? Just wondering. Your knitting is just awesome and so are the photographs of your knitting. Is this more than just amazing talent? Is there a better than average camera involved as well because my photos have never look half that great. I'm interested to know about the 5 steek stitches. Did you knit those 5 stitches through the back loop to twist them? I've read that twisting them insures that the stitches when cut in addition to the crocheted chain makes the steek more secure.